Think your tyres are expensive? Ever wondered what are the most expensive tyres in the world? We’ve assembled a list, from some of the most expensive to some of the “cheapest” tyres. Please note that the models and estimated prices below are as at time of writing – keep your eyes open for an end of year sale! How many landings can jumbo jet airplane tyres take? Not many. Lifespan: Good for about 300 landings which equates to 6 months’ service. Some more extremely expensive tyres belong to the world’s biggest earthmover. The tyres are covered in chains to extend their lifespan. Lifespan: 12 months with chains. The Caterpillar, a massive mining vehicle that carries heavy loads, needs heavy-duty tyres like the Michelin 59/80R63 XDR tyres. 47 nuts hold each tyre to the axle. 6 of these tyres working together can carry a total of 1.37 tonnes including the Caterpillar and its load. Tyre specs: 5.3 tonnes in weight each. 3.9m in diameter. Designed by Austrian engineers, this is the wheelchair for the ultimate thrill-seeker. 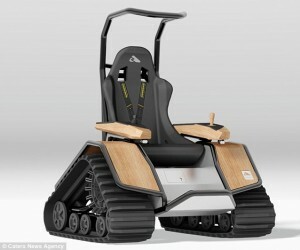 Its rubber tracks were inspired by army tank tyres and enable the wheelchair to traverse steep slopes. The Tubular steel frame and the 4-point safety harness provides rollover protection for the driver. It can reach up to 35km/h but it uses high performance motors powered by lithium ion batteries, so there’s no roaring engine or exhaust fumes. Its autonomic heating system for use in low temperatures has made it a popular sight on European ski slopes. Optional features available include a towbar for snowmobiles, extra chargers and a bespoke paint job. Cost: £19,000 for the whole wheelchair (more than $39,000). These tyres are made specifically for this model, one of the world’s most expensive cars. Designed and developed by Volkswagon, the Bugatti Veyron is also one of the fastest cars, running at speeds of 400km/h and reaching 0-300 in less than 14 seconds. At such high speeds, the Veyron needs tyres that provide amazing handling, control, and traction. It uses specialised PAX run-flat tyres that just keep going after a puncture. Considering these tyres bring a shuttle home from space, they don’t seem that expensive. They’re built to run at speeds of up to 420km/h and are pumped with nitrogen gas to 340psi. They can carry 56 tonnes. Tyre specs: Not much bigger than your average truck size. Lifespan: One landing (main landing gear tyres). Two landings (smaller nose tyres). Each monster truck tyre is hand-cut and takes about 50 hours to build. They’re made for rough, tough driving. Tyre specs: 2.6m high and 1.7m wide. Each is hand cut – taking up to 50 hours per tyre – for specific track conditions and driving style. 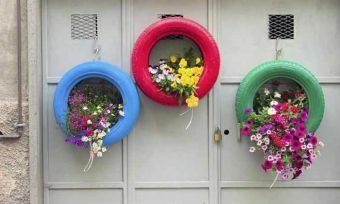 Lifespan: A few shows or competitions. The average monster truck team goes through 8 tyres each year. The Boeing 747 uses 2 nose tyres and 16 main tyres. Tyre specs: Weighs 110kg each. 1.2m in diameter. Lifespan: 6 years (main tyres) with industry standard re-treading. Like the Bugatti Veyron tyres, F1 tyres are made to support incredibly high speeds, but they have lower resistance to wear and tear and punctures. 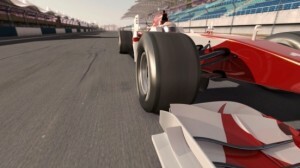 For this reason, teams generally have a minimum of 20 tyres per car in their pit stops. The 1929 Leyland Lion bus is the premier exhibit of the Lincolnshire Road Transport Museum. For the museum’s 50th anniversary, new tyres were made in the US to make the bus roadworthy again. Sadly, the Leyland Lion is the only survivor of its model. Its three siblings passed on after their WWII transport service, while the Lion was used as a snowplow. The museum acquired the Lion in 1954. These rubber options for the rear tyres suit a range of the Porsche cars, not including Proton S16. Lifespan: 30,000km (if you treat them nice). The smallest and lightest tyre on our list is the high traction Silane road tyre. Features 10% less rolling resistance than rivals. Tyre specs: Weighs just 230 grams. 700mm x 22mm. Lifespan: How long is a piece of string? It depends what you use your 4WD for. On average, they can last anywhere from 30,000km on open roads and highway driving, or 150,000km on bitumen roads. Exclusively off-road driving on rocks will decrease your tyres’ life to as little as 10,000km. Michelin tried it with their Tweel but it was too noisy; Bridgestone tried it with their thermoplastic spokes but they weren’t durable enough. Now Polaris has had a go at making an airless tyre that can’t go flat for the Sportsman vehicle, and theirs is the best-looking attempt so far. 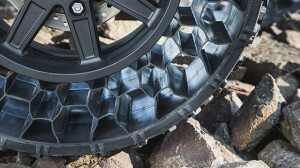 Similar to the Tweel, the Polaris tyre is made from plastic spokes in a honeycomb web. The Polaris airless tyre can cushion heavy loads, absorb shock, and can keep driving for over 2,000kms after being punctured by a .50 calibre bullet and rail spikes. In fact, this tyre can keep driving smoothly after 30% damage to the web structure. Cost: It’s expected that these tyres will cost just $500 each when they become available for consumers.